This turned out a lot better than I thought. Spaghetti Squash has become one of the most versatile ingredients in my kitchen. Tonight, I made a delicious shrimp scampi with red bell peppers and asparagus and served it over the spaghetti. Give it a try! It even tasted good cold. A paleo friendly take on shrimp scampi over spaghetti. Step 1 In a large saute pan on medium-high heat, add olive oil, butter, shallot and garlic. Step 2 Once the shallot is translucent, add red bell pepper and asparagus. 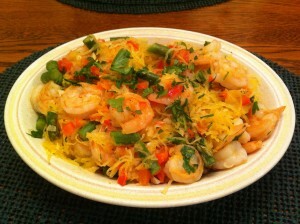 Step 3 When your vegetables are tender, add shrimp, lemon juice, lemon zest and chili flakes. Step 4 Once the shrimp are pink and slightly opaque, add spaghetti squash, fresh parsley and toss together, making sure to coat the squash well. Step 5 Place in serving bowl and top with freshly chopped parsley, a drizzle of olive oil and some lemon zest.